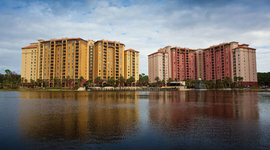 Wyndham Bonnet Creek Resort is one of the few non-Disney resorts located inside the gates of Disney World. It’s an action-packed vacation palace that surrounds a gorgeous lake in the middle. There are five outdoor swimming pools, two lazy rivers, dozens of water features, mini golf, playgrounds, movie theaters, and tons of other family-friendly amenities. If you’re itching for some alone time, you can sign the kids up for the “Play Days” activities program, which includes games, contests, crafts, and themed events. For a bite to eat, you have four restaurants ranging from pool bars to pizzerias, and tropical grills. It’s also a great place for events with banquet halls and meeting rooms. For a little exercise on vacation, head to the fitness center, stocked with top of the line equipment. Condo rentals at Wyndham Bonnet Creek feature spacious bedrooms, full kitchens, living rooms, dining areas, outdoor balconies, and in-unit washer/dryers. But best of all, Epcot is a quick five minute shuttle ride away, so you don’t have to worry about navigating the Disney parking lots. 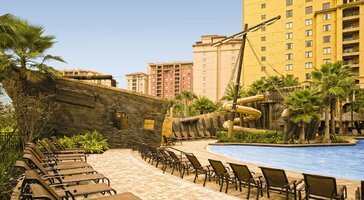 Wyndham Bonnet Creek Resort is one of the few non-Disney resorts located inside the gates of Disney World. It’s an action-packed vacation palace that surrounds a gorgeous lake in the middle.